Obtaining a Michelin Star and two Repsol Sols involves great responsibility; and once obtained, maintaining them is due to great effort and the constant search for update. Aware of this requirement, Manuel Alonso, owner of the Casa Manolo restaurant in Daimús, Valencia, does not only work to improve and innovate in his passion for catering; he is also aware that a pleasant environment helps to improve the experience. 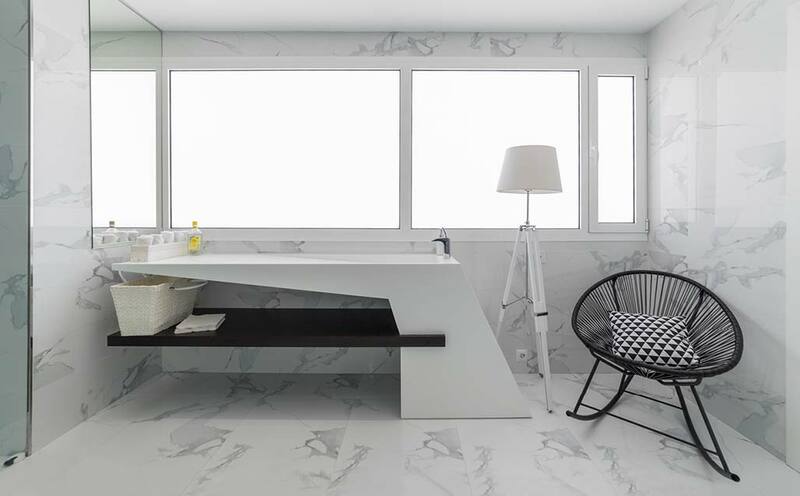 With this desire for improvement in pursuit of excellence, KRION, the Solid Surface from PORCELANOSA Group appears in the recent opening of the restaurant’s new bathrooms. We can find KRION in the colour 1100 Snow White, transformed into an almost sculptural piece for use as a washbasin. Straight lines, slants, the combination with natural wood and the play of black and white colours with decorative items make this room a comfortable place on par with the spectacular cuisine presented by Manuel Alonso, who has a Michelin Star and two Repsol Sols, at his restaurant Casa Manolo.